Twiggy Swinging 60's - Pop Art is a photograph by Andrea Kollo which was uploaded on October 1st, 2018. 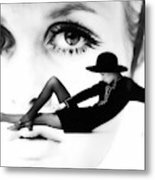 Twiggy is synonymous with the swinging 60's; a time of phenomenal change and forward motion in society. This pop art photo I hope expresses a unique and very special time in our history. There are no comments for Twiggy Swinging 60's - Pop Art. Click here to post the first comment.